Josh Petty in his "Jim Morrison" phase. Photo by Keith Wilson, originally appeared in Daily Bread Magazine. Josh Petty was in the midst of his Jim Morrison phase. He was wearing black leather pants, without a shirt (or underwear), and holding a bottle of Jack Daniels in one hand and a switchblade in the other. He even got a tattoo on his stomach that read, “Rider on the Storm,” (you know, because he was a solo rider on the storm). This is how I remember Josh stumbling through Europe while we were on tour back in the late nineties. I had a successful company called Senate that made wheels and accessories for aggressive inline skating. We put together a tour of our pro riders, whom we'd dubbed “The Kill Team,” to travel across Europe doing demos and exhibitions and to attend European skate contests. Josh Petty was one of our star riders and one of my personal favorite skaters. Josh Petty on the cover of Daily Bread Magazine, circa 2002. Josh had all of the qualities that make a great skater, he was talented and fearless and he had good style, but he also had some additional qualities that made him a special skater -- one of the great ones. Josh had vision. He had a point of view. Josh was aware of his persona and he cultivated it; he didn’t just have influence, he knew how to exert it. Josh went through several major reinventions throughout his career. He went through a Wu-Tang/hip-hop phase, he went through a rocker phase, he went through the aforementioned Jim Morrison phase. But the genius of Josh and the genius of his skating was that at every stage, in every single moment, Josh was always completely genuine. For as different as one phase may have appeared to be from the last Josh never came off as inauthentic. His tastes were varied and diverse, but just like his skating Josh threw himself into everything one hundred percent, even if it meant squeezing into leather pants and going on a whiskey diet for two weeks while in Europe. I got a chance to hang out again with Josh this past weekend. He was in town visiting from Virginia where he lives with his wife and daughter. I met up with Josh and Brandon Campbell, another old school friend of ours (who incidentally also cuts my hair), at Turner’s Pub 33 in Costa Mesa (formerly the Bikini Bar). Arlo, Brandon Campbell and Josh Petty at Turner's Pub 33 in Costa Mesa. It had been years since I’d seen Josh. We’d stayed in touch, mostly via social media and mostly in the form of friendly debates. In the years since those halcyon days of after parties and world tours Josh and I ended up on different paths and on opposite ends of the faith vs. science spectrum. I have documented on this blog already my journey to Skepticism and how a single international flight (and a Skeptic magazine) changed my life forever. Meanwhile, Josh, who had a somewhat religious upbringing, but who had a pretty significant and sustained period of rebellion and experimentation in defiance of his upbringing, eventually found his way back to religion. And as with all things that Josh has ever done in his life, he jumped back in all the way, one hundred percent, even teaching a Sunday school class at his church back in Virginia. Josh and I came up together. As is the case with a lot of the skaters that I grew up with we became very good friends. We had a lot of the same influences, we skated together, partied together, listened to the same music, wore the same clothes. It is not surprising then that as adults our tastes and our aesthetics are not that dissimilar. Josh and I both like tattoos. Josh and I both have a lot of tattoos. But, whereas my tattoos reflect my Skeptical/scientific worldview, Josh’s tattoos are mostly religious – and they are ALL OVER his body. Josh has the Virgin Mary and Jesus tattooed on his stomach. He has Jesus’ crucifixion and resurrection on his chest. 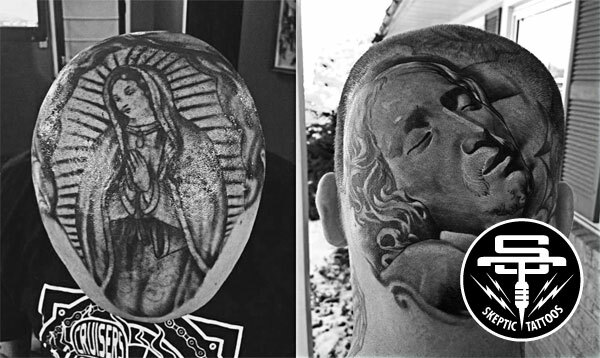 Josh’s entire head is covered in tattoos including a portrait of Jesus on the back of his head and another of the Virgin Mary on the crown. Say what you will about Josh, he may be nuts, but he is always genuine and he is always entertaining and he ALWAYS gives one hundred percent. In the next post, Part II, I will revisit an argument/discussion that Josh and I engaged in on Instagram (of all places!! ).